tap wrote: Yes initially I went with more or less a faith based attitude, but I also want to understand it on a different level. After looking at Birla's theory, I googled some on the super conscious to try to understand it more myself. This is one of the sites I found to try to understand this myself. Going down a similar path I found myself at the cellular level. This is from a paper I wrote and was presented last summer at the IBMBS conference entitled "Star-Delta Triradii: Human Impulse Markers" Here it describes a little how I understand the connection between the hand and the brain. Describing cell proliferation, the researchers concluded by saying that the dermatoglyphics can “reflect the ontogeny of the afferent nervous system that occurred prior to papillary ridge development. These observations lend support to the concept that successive waves of afferent neural development have an important role in spatial and temporal sequence of papillary ridge formation and thus the formation of both the dermatotopic map of the digits and the dermatoglyph.”20 *20S. J. Moore, B. L. Munger, Pennsylvania State University, “The Early Ontogeny of the Afferent Nerves and Papillary Ridges in Human Digital Glabrous Skin”, 1989.
and this is what is happening in the brain. Thanks for sharing this with me and I appreciate your time and effort to help me understand this. I find all of this fascinating! I still have some questions with grasping all of this. It is my understanding that the word "afferent" is related to the connection between the peripheral and central nervous systems with the direction of peripheral-to-central. Wouldn’t this mean the growth of nerves is from the extremities ( like fingers) to the central nervous system ? In this case, is the brain kinda left out on the influence of fingerprints? Did you mean to say impulses affect the fingerprints once the connection is made? Considering the the brain is affecting how the fingerprints/dermatoglyphics form I wonder how far along the brain really is in development when they are forming. It almost seems like the brain at this state could be less than primitive and barely functioning. I believe humans can't form memories until three-four, and babies struggle with the most basic of functions. It's somewhat hard to believe that a fetus with a brain much smaller and less developed than a baby would possess any real characteristics that could be translated into adult life. So with this in mind, I am having a hard time really following how this connection between the hands and brain are reflected at birth and really I am not sure how the connections are reflected after birth past the use of hand movement/gestures and the limbic system. I hope this makes sense to where/why I seem stuck in my understanding and learning this. Ramann wrote: Mr.V.Ramachandran's book-Phantoms in the brain will give a beautiful account of the brain and how they function. Beautifully illustrated with case studies it makes an easy and comprehendable read for a lay man. Nobis, does this book also tell about how the different parts of the hand are related to the diff features attributed to them? Recently I read "The Biology of Faith" by Bruce Lipton and found there a scientist who shared my enthusiam. I think cellular is the way to go! p.s. I think you'll love the biology classes! When I was reading the text books I was wishing I had chosen a career in lab research. I have an uncle that is a molecular biologist. Growth during development is proximal to distal. Distal is the fingertips. Think of a tree growing and spreading out into branches and then leaves. The leaves wouldn't appear first. (edit: there is however often an anticipation of the leaves in formation) Originally nerve related cells come from the neural tube and soon after the spinal cord and newly forming parts of the brain. It becomes more complex from there. The impulses are what a part of my paper is about and the connection from the dermatoglyphics to our emotional and mental centers using existing research studies to support the various connections and results. Studies have been done individually but not much has been done to combine this information into something that works for our field as hand analysts. For instance those that study which cells relate to touch and which to pressure are not blending their studies with those that study synapses in the brain and the timing of these early synapses along with the appearance of permanent features in the hands. Those that study the communication pathways of signals to the heart and mind are not concerned that a new red blotch on the life line has any significance or relationship to each other. But we are interested, and we need more scientific minded hand analysts in the field to make these connections in a setting that gives it credibility. So kudos again to you! I think the features that form early, before birth, and are relatively permanent, relate to innate aspects of ourselves. These could be physical appearance and condition as well as our pre-wired way to respond to things. Our natural preferences. Thanks for going into a little more detail. I appreciate it. It is kind of frustrating that the different scientific fields are not collaborating more. Yes, I was thinking the fingerprints could relate to something like basic disposition/temperament. I like your cell description of its self awareness. The book you recommended sounds like an interesting read. Still I believe your book will one day be a favorite of mine. When do you think it will be finished and published? Nice thread and discussions on the connections between hand and brain. Would be interesting to learn more about your research Patti! While searching for information on the book, The Biology of Faith , by Bruce Lipton, I found this article referencing this book and summarizing some of Bruce Lipton’s observations and theories. It is really interesting to ponder how the hands may be reflective of this. Coincidentally I am on Bruce Lipton's newsletter mailing list. I've only received 3 mailings since December of last year. The 3rd just happened to arrived yesterday a short time after I posted that comment. It startled me for a moment to see his name in the 'from' column! "It's a good article but it seems like someone ran it through a translator a couple of times" agree. "Coincidentally I am on Bruce Lipton's newsletter mailing list. I've only received 3 mailings since December of last year. The 3rd just happened to arrived yesterday a short time after I posted that comment. It startled me for a moment to see his name in the 'from' column! lol!" Looking forward to his book arriving! Just a quick question. Is this book written for a novice? Since I am not familiar with the nomenclature in the scientific field I was wondering if I should wait until I take some courses. I have the local library shipping it over…so I guess I could just give it a try. Yes it's written for the mainstream. I think you will enjoy it. This might answer some of the qtns here. 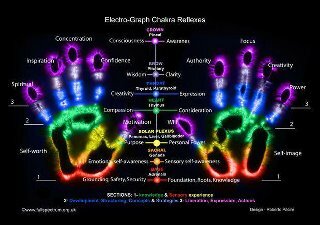 I can't read all the words in the image, but I can tell it has to do with the chakras in the hands. Tap, this is related to Chakras. But, it also says something about the individual fingers too. I havn't visited the website. Just posted it here by looking at the pic. Going thru the website might give you some info.